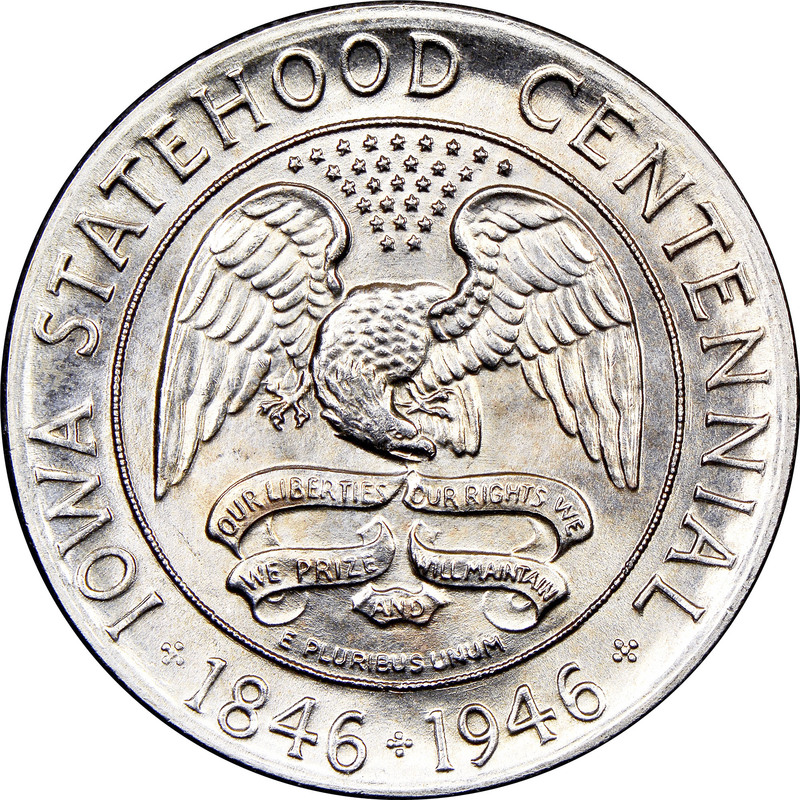 The 1936 Iowa Centennial Half dollar stands as a monument to effective and equitable distribution of a commemorative coin. As opposed to many other issues in the classic commemorative era, there was no corruption of any sort associated with the coin’s production or sales. Additionally, the design of the coin was quite attractive, which is more than can be said of many other commemorative coins of the era. The program was the first commemorative coin to be approved since 1937, even though many had been proposed during that time. The numerous abuses and scandals involved with past commemorative coin issues had caused both Congress and President Roosevelt to become opposed to approving any new programs. With Harry S. Truman in office, Iowa managed to get the bill for the new coin passed on August 7th, 1946. It authorized the coining of not more than 100,000 coins. U.S. Mint director Nellie Tayloe Ross selected a former mint engraver, Adam Pietz, to sculpt the new coin. Adam Pietz’s obverse design depicts a heraldic eagle grasping in its beak a banner inscribed in several lines OUR LIBERTIES WE PRIZE AND OUR RIGHTS WE WILL MAINTAIN. This motif is a simplification of the Iowa State Seal. A constellation of 29 stars is above the eagle, indicating Iowa’s role as the 29th state admitted to the Union. E PLURIBUS UNUM appears in arc form, placed in small letters beneath the banner. 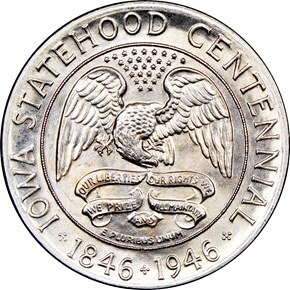 Outside, arranged peripherally, are IOWA STATEHOOD CENTENNIAL and the dates 1846 and 1946. 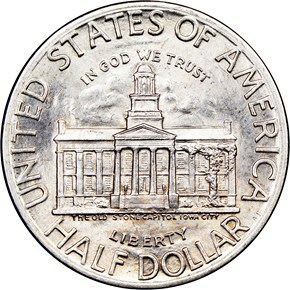 The reverse of the Iowa half depicts an elevation view of the Old Stone Capitol at Iowa City, so identified below it. Billowing clouds appear above and behind the structure along with the motto IN GOD WE TRUST, arranged in an arc. Also in arc form is the motto LIBERTY, placed below the building. 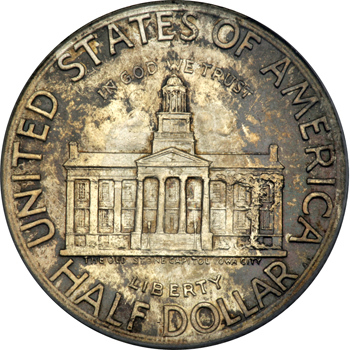 Around the periphery are UNITED STATES OF AMERICA and HALF DOLLAR. 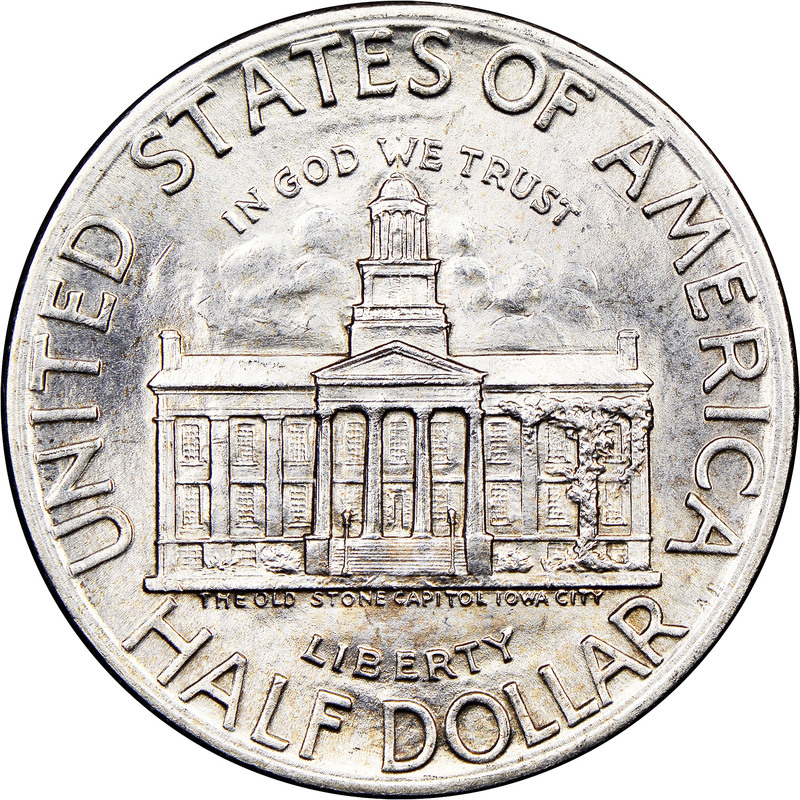 The full authorized mintage of 100,000 coins was struck in November of 1946. 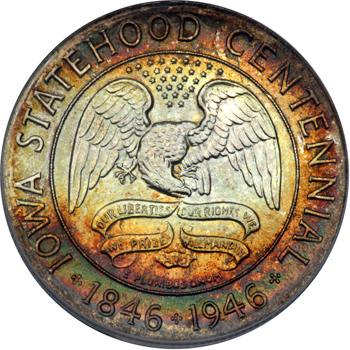 The State Centennial Sub-Committee on Coin clearly wanted all Iowans to have the chance to buy a coin if they wanted one. Therefore, the coins were priced $2.50 for Iowans or $3 for those out-of-state. However, 95% of the mintage was to be sold in Iowa via a population-based lottery system. By March of the following year, the supplies were completely exhausted with the exception of 1,000 pieces held for future distribution in 1996 and 2046.